Only two airworthy Avro Lancaster bombers exist in the world out of the 7,377 that were built… and to the joy of aviation enthusiasts worldwide they will be brought together this August. 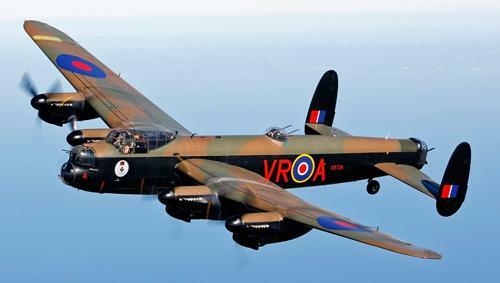 News that the Canadian Warplane Heritage Museum’s fabulous Lanc will fly across the Atlantic to join forces with the RAF Battle of Britain Memorial Flight’s celebrated example has set the Internet all a-twitter… and rightly so, too. It is arguably the single biggest event of its kind in historic aviation in the past 50 years – and which in all honesty few enthusiasts ever thought would be feasible. Now we may all look forward to a month-long series of public appearances to be undertaken throughout the UK by the Lancaster pair at some of the biggest air displays in the world. The Canadian Warplane Heritage Museum’s Lancaster Mk. X was built at Victory Aircraft in Malton, Toronto in July 1945. Although she did not see wartime service, she was rebuilt in 1952 following a serious accident and the centre section which was fitted during the repairs did in fact see operational service over Germany. She flew as a maritime rescue aircraft until 1963 and then lay dormant until 1977, when an 11-year project saw her restored to airworthiness as a memorial to the 9,887 Canadian aircrew who perished in RAF Bomber Command. The Lancaster is dedicated to the memory of P/O Andrew Mynarski and is referred to as the “Mynarski Memorial Lancaster” and is painted in the colours of his aircraft KB726 with the codes VR-A, which flew with RCAF No. 419 (Moose) Squadron. Andrew Mynarski won the Victoria Cross, the Commonwealth’s highest award for gallantry, on June 13, 1944, when his Lancaster was shot down in flames by a German night fighter. As the bomber fell, he attempted to free the tail gunner trapped in the rear turret of the blazing and out of control aircraft. The tail gunner miraculously survived the crash and lived to tell the story, but sadly Andrew Mynarski died from his severe burns. Now the Canadian Lanc is being fettled for the marathon 18-hour flight which will depart from Hamilton, Ontario on 4 August and is expected to arrive in England on 8 August. The North Atlantic crossing will be in bursts of no more than five hours and will include en-route stops at Goose Bay, Labrador, Canada, Narsarsuaq, Greenland, and Keflavik, Iceland, prior to arriving at RAF Coningsby in Lincolnshire – home of the Battle of Britain Memorial Flight. Shortly after arriving, the Lancaster will undergo a scheduled maintenance inspection and then the Canadian crews will complete a short training program with the BBMF in preparation to participate in air displays and fly pasts with the current schedule starting on 14 August. A full schedule will be released in the near future that will provide full details about the Lancaster pair’s appearances in 2014, including stops at Coningsby and Humberside, flypasts including Middleton St. George and East Kirkby and a host of other special events. Tickets for Little Gransden already sorted, Nick, but then we go every year to this superb air and car show. Fantastic, Martin. Have you got any pics from recent shows?